With Auckland Transport moving to having less frequent board meetings it makes it more difficult to get monthly updates. However, while not quite as detailed as the reports presented to the board meetings, we can get an indication as to how performance is going from this ridership report AT update monthly and has been updated to include January. Overall ridership for January was 5.64 million, up 6.7% on January-2016. Importantly, on a 12-month rolling basis ridership has now surpassed 85 million trips. That’s pretty good considering that only just passed 75 million just over two years ago. The majority of that 10 million increase has come from the Rapid Transit Network which increased by 7.7 million trips over the same timeframe. While we haven’t yet seen the January version yet, the results for December show positive movement once again on metrics such as weekday boardings and farebox recovery. The strong growth on the rail network in particular, is seeing boardings on business days skyrocket and as you can see the difference between Dec-16 and Dec-15 is substantial. As you can also see, March tends to set a new benchmark for usage so we’re expecting another big jump this year. Could we hit 80k per day? Farebox recovery had taken a dip recently which was expected to a degree with the introduction of Simplified Fares. While only one data point so far, it has hopefully started to turn around now as I suspect this is what could partially be behind AT not improving aspects like rail frequencies off peak like they need to. What is also interesting is the subsidy per passenger km for bus and rail are now close to identical and I suspect in a few months, rail will actually perform better. 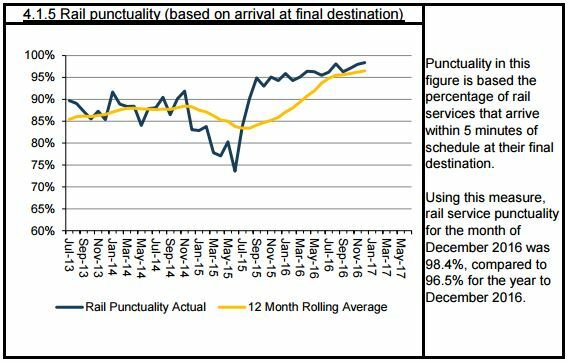 December also set a new record for rail punctuality with 98.4% of all trains arriving at Britomart within 5 minutes of their scheduled arrival time. That’s a far cry from the months before the full roll out of electric trains when it plummeted to below 75% with the old trains breaking down frequently. Bus use continues to fluctuate a bit but as a general trend is going up and to for Jan it was up 0.8% to 24.3 million. great stuff. One other piece of good news I found from diving into the report itself: ~80% of trips in Dec-2016 were made using HOP, compared to ~65% for Dec-2015. That represents decent YOY growth in HOP uptake, which one would expect to continue as the PT network is re-shaped to work in a more integrated fashion. Targets for next year? I’d like to see HOP reach ~90% of all journeys on average, such that AT can start implementing more progressive measures to reduce incentives for people to use cash, e.g. bump up cash fares and no change onboard. TBH I think that’s a completely unnecessary step and is probably (rightly) illegal to not give change. I would guess most cash payers do so off peak or have very limited financial means and can’t afford major top ups. In which case your suggestion becomes a horrible regressive tax. Agreed; we don’t want to discourage the edge use cases from using public transport for specific events. depends on how it’s implemented, and your definition of regressive. If people pay with correct change, then they are good to go. If people pay with a tenner, given them a HOP card with 1 cent pre-loaded. That will allow them to ride, while also making it easier and *cheaper* next time. Whether it’s regressive at the individual level depends on the number of trips the person takes. If someone really is poor, them helping them get a HOP card as soon as possible will help them save money if they use PT more than, say, 2-3 times in their lifetime. And don’t forget that efficiency gains across the PT system can be progressive when you take a longer term view: If you strip cash out of the system, then you basically speed up services and reduce your operating costs – which allows you to run more service for the same level of subsidy. That’s one reason why most North American systems don’t give change onboard, and they have much higher levels of poverty than in Auckland. In terms of edge cases, many systems — such as Copenhagen — are already allowing customers to buy cash tickets via their phone. Such things are available now and can be part of a comprehensive strategy to strip cash out of the PT system. It’ll be great, the best. P.s. I suspect legality is not an issue, hence why machines can only accept “correct change”. Many overseas operators have an exact-fare-only policy when cash is tendered, and cash is not accepted on London buses. Provided there’s widespread availability of non-cash options, this doesn’t seem to be a particular issue. HOP needs to get a lot better with retail/top up machine locations before going that way. It’s also not exactly easy to get exact change thanks to ATMs mostly giving min $20 and retailers requiring you to make purchases or outright refusing cashouts or breaking down a bigger note – in the 90s it was just common courtesy but now they are just greedy. I’ve found myself falling back to cash quite often, forgetting my HOP card, it being disabled, nowhere to top up or most recently the card completely failing. I disagree: I don’t think the (near) future of (non-HOP) ticketing will require AT to develop an extensive network of costly third-party retailers. I think it will involve people buying tickets though an app on their phones, which then generates and delivers the ticket right there and then. No finding a store, queuing blah blah blah. And because it can be linked to a journey planner, you can get the right ticket every time. Well with snapper I just held the card to my phone entered my debit card details and bam the balance is loaded. Jumped on the bus seconds later, balance was there. Now I have to load up the AT website to find a retailer, which most of the time there won’t be one within walking distance or sleep in the bus shelter (if there is one….) for 48 hours until my online top up processes. So yeah sure I disagree too but it’s either instant topups from anywhere (like we could in 2012) or more retailers (uh which we also had in 2012). Snapper are pulling out of the retail payment side of things in Wellington as they have realised they have lost the contactless payment battle to Visa and Mastercard. At the moment I think they still have widespread coverage to top-up machines, but I doubt that will be viable once they start needing replacement/upgrading etc, so I’m not sure we would have ended up with this level of Snapper functionality long term in Auckland anyway. Snapper doesn’t have auto topup though (cough cough) from memory? Why can’t I just top up my hop card at any Pay and Display machine on the street. We already have infrastructure to take cash. Because AT doesn’t bother to fix half of them and puts a notice on saying it won’t accept cash. You end up messing around with txts while cursing anyone who has ever worked for AT. This comment was meant to be at the bottom. 2) manage the budget impacts, i.e. not enough dosh to do it all at once. I don’t think it’s far away at all. Stu is responding to my comment about ferry passengers being screwed. Sorry Stu I moved my comment down. Chrome seems to put a second comment after the first even when I click the bottom to start a new line. no worries — happens to me sometimes too. Brendan, that would involve installing RF equipment in every pay and display machine and reprogramming them. A very expensive proposition I’d think. Great to see continued growth and finally some growth out of the non-RT bus network. It would be good to see the ferry portion of the graph at the top rather than as the base as the growth in ferry patronage is flattering bus numbers (making non-RT buses look like they are growing when in many cases not much has been happening there). So after passing 18m rail journey’s in December for the rolling year with this continued growth we must be rapidly approaching the governments former 20m target for CRL (and could finish the year on possibly even 21m – provided there is the capacity for that many). No. Ferry growth is good, but minor compared to RT growth, so to put it at the top would overstate its scale. It’s in the right place, a steadily improving and important, but necessarily limited by geographical constraint. Trains now at 18.3 million – yes, we’ll make that 20 million target with ease. Imagine what could be done if AT actually boosted the off-peak and weekend service frequency, and made some speed improvements? AKLDUDE -I am not convinced that growth stopped on the non-RT routes. My understanding is that all the figures for buses that used the Northern busway at some point were removed from that figure.(i.e. buses ex Long Bay, Browns Bay, Milford etc). While this had only a small effect on the non-RT figure it gave a very significant boost to the Northern busway figures. Patrick, can you confirm please? Are there any information and data regarding the effect of the new south network? Also are ‘trips’ count every boarding and every transfer or is a trip the entire journey including transfers? Now lets get some toilet facilities in many of our stations. Its ridiculous how many stations have no basic facilities. While were at it, lets also extend the shelter canopy. Will those toilets need station masters to keep an eye on them so they don’t get trashed? If so, could the same people also be dispatchers on the platform to help the drivers operate with DOO? Would you need less people than current number of TMs to staff every station on the network 7-7pm? Maybe then have security guards on trains after that time as “2nd man”? There’s no station master at Onehunga, which has toilets so it might not be something that is necessary. Someone may correct me but I think there are around 32 services on the network at peak, so 32 TMs, maybe around 17 off-peak. There are currently 40 stations so I think TM’s would still be cheaper, not that DOO necessarily requires anyone else other than the driver. Most of the stations with toilets are simply public toilets next to the station, no different from any other public toilet at a park, beach or village centre. 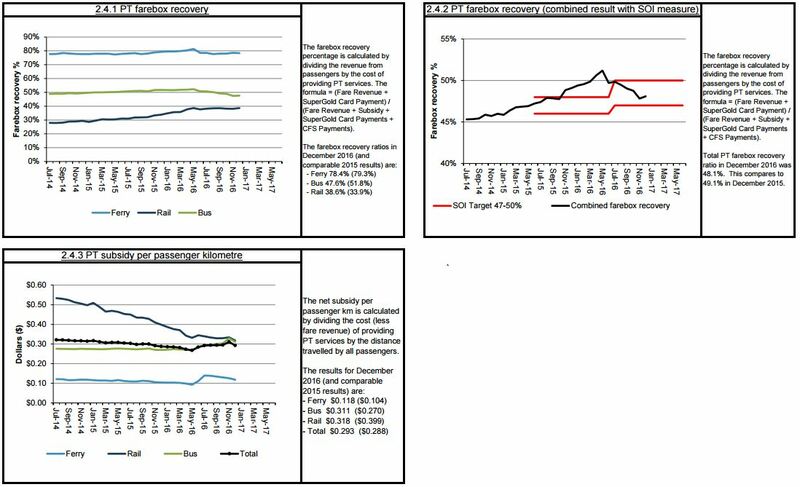 Interesting to note subsidiary per km travelled for rail is same as bus, but fare box recovery is lower. That would mean rail is more efficient for long distance travel. Does anyone know why the ferry passengers are being screwed? What happened to modal neutrality? Because Steven Joyce. They kept the two good, busy and efficient ferry routes as fully commercial, while making the rest almost entirely subsidised. A classic privatise the profits and socialise the loses situation. Given the vast majority of passengers are on the two commercial routes the farebox recovery is very high…. and there is no cross subsidy from profitable core stations to less profitable local ones, as happens on bus and rail. No contract with regional council, no fare regulation and no measurements in the annual (performance) league table. The above is true with regard to fare regulation and enforcement of timetables etc, but in fact Steven Joyce’s legislation was written in anticipation of integrated fares, and specifically refers to council being able to deal with Fullers to reduce fares. Instead, AT has deliberately elected not to make such an arrangement with Fullers, preferring as mfwic says to continue to screw ferry passengers on fares and to lock ferry users out of fare integration. Our mayor and councillors have been less than weak on this issue. Now that we have Richard Hills, who campaigned on reducing fares during the last election, we might finally see the council taking some responsibility for this mess. And there was me thinking they were being nailed. If they can report rail punctuality as ‘arriving at final destination on time’, why cant they do the sames for busses. Reporting punctuality as departing origin on time is ludicrous. Because there is an existing system that records with near-absolute certainty the time each train service reaches its destination (and many other points besides). Doesn’t HOP do the same for buses? AT will have the timestamp from each boarding and alighting on every bus trip. iirc the buses are also GPS tracked for the real time displays. “December also set a new record for rail punctuality with 98.4% of all trains arriving at Britomart within 5 minutes of their scheduled arrival time. That’s a far cry from the months before the full roll out of electric trains when it plummeted to below 75% with the old trains breaking down frequently.” – Wow, I can’t wait until PTUA bring back those old diesel trains that obviously either ran faster or more reliably (or both) than the EMUs to achieve on time as good as 75%! People will also be able to write down the numbers of the 40 year old loco’s as the trains go by, which will also drive patronage, as who doesn’t love spotting a different loco on each trip? Bear in mind that emu timings and turn-around times have been considerably relaxed in comparison to the old diesel timings. This has traded faster journey-times and better stock-utilisation for punctuality. If you had slackened the diesel timetables similarly, then their punctuality may well have looked better, though this would not have helped in breakdown-situations (exacerbated by the winding-down of maintenance). Beware when not comparing apples with apples. PTUA’s proposal to re-introduce SA sets is a pragmatic response to the looming shortage of emu’s. Acquiring and maintaining reliable motive-power is obviously a crucial part of this, but should result in reliability comparable with the heyday of the full diesel-service. I don’t see anyone else offering a solution to this impending problem except do-nothing, cross-fingers and hope. I’m not sure PTUA’s proposal is much of a solution. Once an hour it will take people that are heading for stations along the route off an EMU service, by my maths it might take 3 % of passengers, with the growth being experienced it’s nothing. Incidentally I don’t know why they are angling for SA/SD sets, this run could easily be done with an ADL multiple unit. Looking at it one way, ridership on non-RTN buses is actually falling. Yes, patronage went up by 2.6%, but my reading of the recent population stats is that population went up by 2.75% in the same period. This is not a good sign . . .
1.People aren’t stupid; they know a good service when they see one, they are choosing high quality ones when they can, and are concomitantly becoming less interested in the standard ones. 2. Massive multi-year $billions spent on new and wider highways in AKL; wouldn’t it be a scandal if there was no take-up response to this? Especially in an economic boom, cuts to vehicle registration, petrol price, car cost (exchange rate), and a rising population? Even though NZTA et al tell themselves funny little lies about induced demand, what if this spending did not provoke an uptake response??? What we feed grows. Sadly of course with the urban RoNS that also means increased traffic congestion, the very thing they are supposed to be ‘solving’. Harrumph. Passenger numbers should receive a huge boost from the Masters Games in April. Every one of those enrolled has a HOP card and for many this will represent the easiest way to travel around the city. Why in 2009 did central government suddenly come up with this “farebox recovery” system? Why did they have to intervene in local government matters to this nanny state level? What indisputable research was the 50% recovery figure based on? Could it be the arbitrary 50% figure was a quick way for Joyce to up fares to discourage PT use knowing local governments were subsidising PT to whatever extent based on their respective local knowledge to encourage PT use over cars? I say this because central government has about as much idea of local issues and their cures as much as Moscow did in the 1950’s. Hence we got more motorways without PT provision! It just pisses me off we dumbly accept Stephen Joyces “farebox recovery” intervention in public transport when he and his government have done next to nothing to promote alternatives to cars! Yikes! 18% growth on rail? Is that 3 straight years of 20% growth on the trains or close to it. How much spare capacity do we have and how long before we achieve it? I’m sure at some point there will be diminishing returns ie. trains get so full that people go back to their cars. At least when trains are full they are still moving. If you want to travel on the peak you will soon discover that when motorways get full they stop moving. Aucklands peak hour trains have oodles of space compared to large cities overseas. 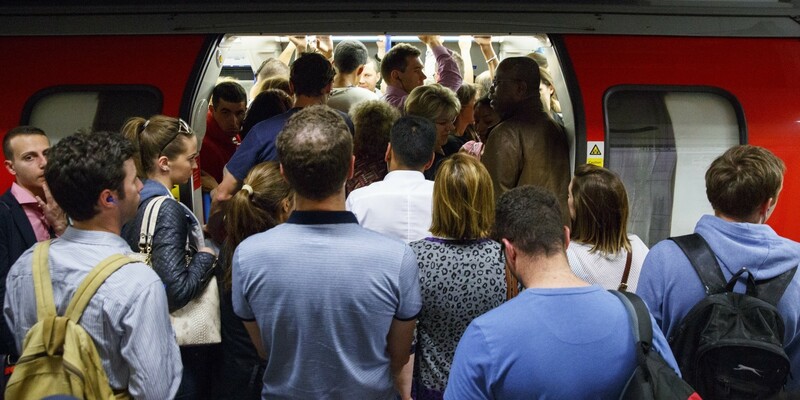 I used to have a crook neck for the day from being pressed up against the door whenever i got the rush hour tube to work. 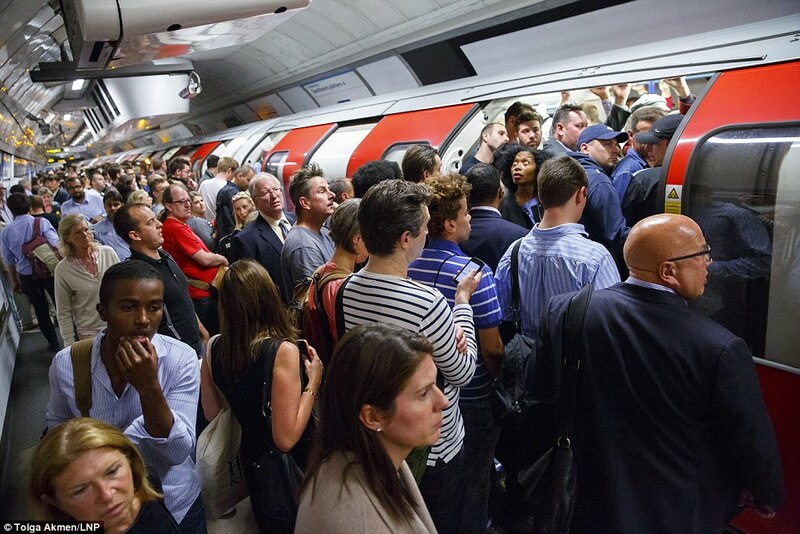 Getting on the Northern line at Kentish Town which is in the highest “5 or more people square metre” crowding category. This was before the signalling upgrade went live in 2015 to support 24 trains per hour in each direction – though it seems they now have a “6 or more people per sqm” category and half of the Northern Line still sits there. Yes it does mean we’ll need more trains, and even more track. But strong growth on a Transit service has the reverse effect to strong growth on the road network. Driving is always better when as few others as possible are doing it. But more people using a bus or train route then it justifies higher frequencies, longer span, better stations etc. Service improves. In a thriving and growing city: Motorway expansions are never as good again as they are when they first open, whereas Transit services keep getting better. So long, of course, as the improvements are made. In a declining city, or one where the politicians won’t invest in the growing Transit demand, then you get crowded services etc.